Ensure that you have launched the regular MicroStation, or other supported Bentley application, and not the “High Security” version of the Bentley product. The high security version typically has a lock on the icon. 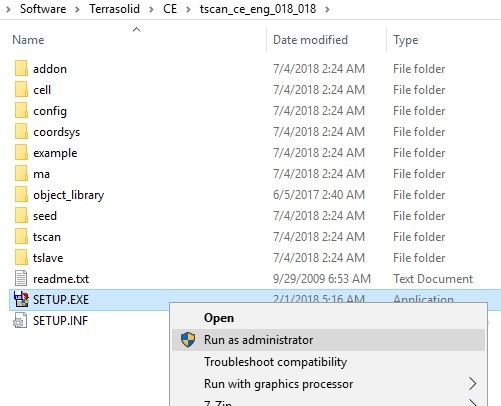 Ensure that the Terrasolid module(s) were installed using the right-click and “Run as Administrator” option on the setup.exe. Ensure that the correct installer was used to install the applicable version of the Terrasolid module for the Bentley application. For MicroStation CONNECT edition, PowerDraft CONNECT Edition, and Open Roads Designer CONNECT edition, be sure to use the CE installers, “tscan_CE_eng_018_018”. For MicroStation v8i, be sure to use the v8i installers, “tscan_v8i_eng_018_018”. For MicroStation v8, be sure to use the v8 installers, “tscan_v8_eng_018_018″.